I am extremely happy with the A1.1 6x6 and would get it again any time. Sorry for the delay in my comment return. Thank you to took you the time to read the post and commenting!!! I found a great advice about the A1.1 model... I have a 1964 car and it is very easy to have and drive... I will take I count what you said about the different models of the truck! I already told the builder about that because it is not the first time seeing the advantage about the early models, but this is the very first seeing the comparison about engines, the builder confirmed it too! I understand about the size, We have a very compact car and aa American style truck... 3.64m vs AWD 5.64m, and as you I know what can I do with every one. I will take in count the size but also comfort too, we like it as well! Any another comment and advice will be much appreciated ! If you need more space, consider an extendable roof like Unicat is doing them a lot. This gives you the benefit of a big bed with the option for a big roof-window where you can look at the stars at night and saves about 1,5m of cabin space. Downside of this is cost and complexity, also it might become problems with dust and water-tightness in the long run. But I think this is a great option. Keep in mind that the upper part often covers the windows, so if you want to have people in the back while driving, the windows should not be covered. However in some parts of the world, kids have fun throwing stones at passing vehicles and there it is beneficial to cover the windows. To my advice of not making it to heavy: mine weighs 16t incl. me/my wife, full diesel and water tanks and everything we take. That is already heavy and I got stuck because of the weight twice. One disadvantage of the 6x6 is the heavy front axle. On the engine: I would suggest the A1.1 with the D2866 Euro 1 engine. Not only it has the most power (309KW/420HP) but the engine is the last MAN engine (to my knowledge) that runs without electronic components, fully mechanical injection pump. That means, once it is running you can drive, even if the electrical system is completely down. Only downside is that retrofitting a cruise control is a bit more complex. Mine uses about 35l/100km. You can get it down to 28l on highways, if you stick to 80km/h but 35 is a good average that includes dust tracks and sand. Obviously, if you play in the sand for days it will be more. Having said that, 700l of Diesel gives you a range of 2000 km which in my experience is enough. I have about 900l on my truck which is perfectly fine. The engine is said to be good for 1mn km before first overhaul, so good enough for any of our use. Another advantage is the strongly reduced noise while driving. I can listen to music and have a conversation at 90km/h. Over the last 2 year that I have the Kat, I travelled 30,000 km and had one serious problem, a broken starter. You can read in another thread about it. The Kat had the generosity to break down 5 km from the next MAN workshop and they got the part within 24h. Now if something like that happens more remote, you still have a new part within a few day. Great advantage, although the forum here is really great and helpful and will work together to help if something goes wrong. I would fit a few add-ons to the Kat such as Led lights, surround view camera and navigation. 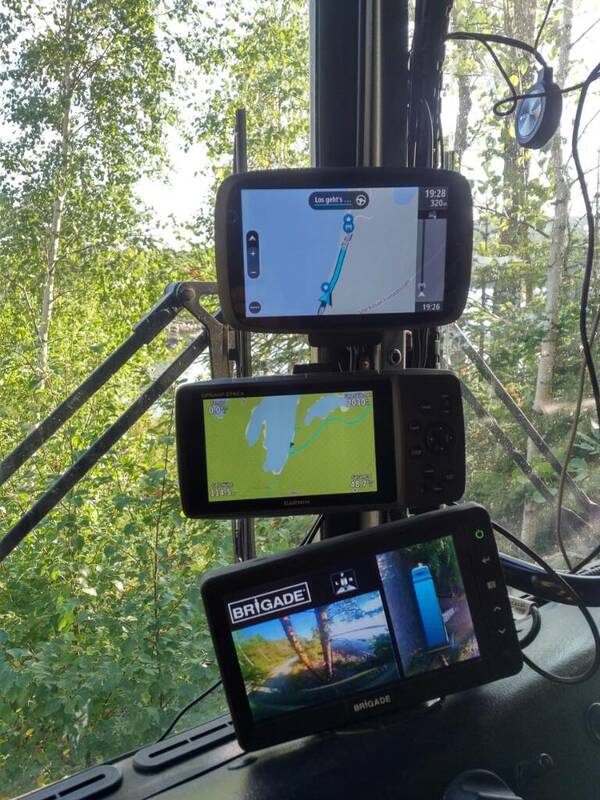 I am very happy with the Garmin GPS 276Cx for several reasons. Also I would go for the Hutchinson rims with beadlocks. A tire inflation system is a nice to have, depending on how often you go to sandy areas. 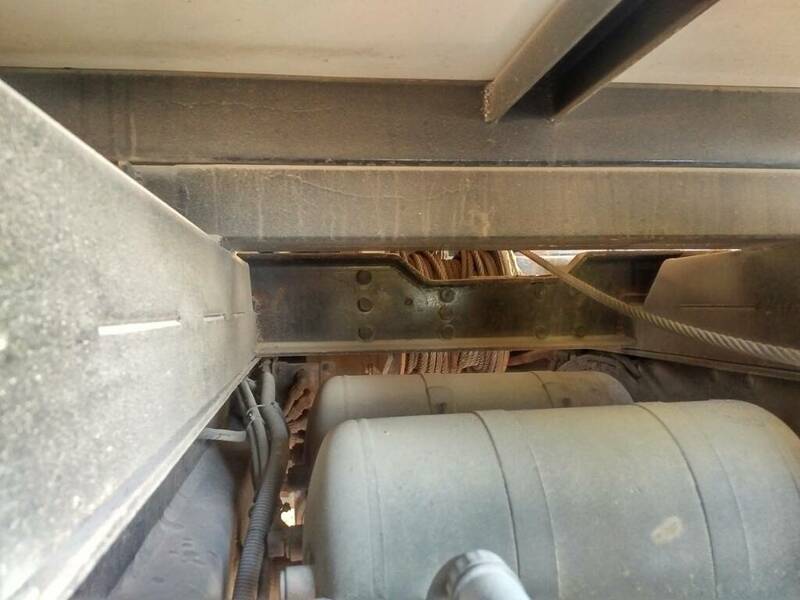 If you manage to get a chassis with hydraulic suspension, this is great to level the truck but is reported to be a complex system, that is difficult to fix. I do not have own experience here. One important decision you need to make is on the power supply concept for the cabin. If you want maximum autonomy, you should not use gas (I do, 22kg serve me for fridge, cooking and heating for 4 weeks but then I need to refill and this might be difficult in remote areas). However maximum autonomy and doing everything electrically comes at a price. I use a 5 kWh Li-Ion battery that serves me in combination with 1kW of solar well. 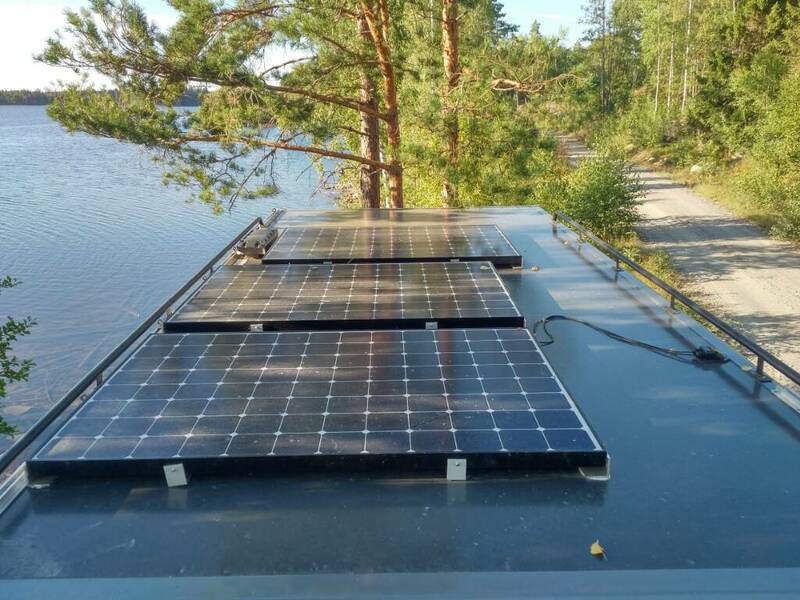 If you avoid gas, 15-20 kWh and 2 kW of solar are your option. So far a few thoughts, let me know if you want more details or have specific questions. Thank you very much again for all this information, it is precious to us! 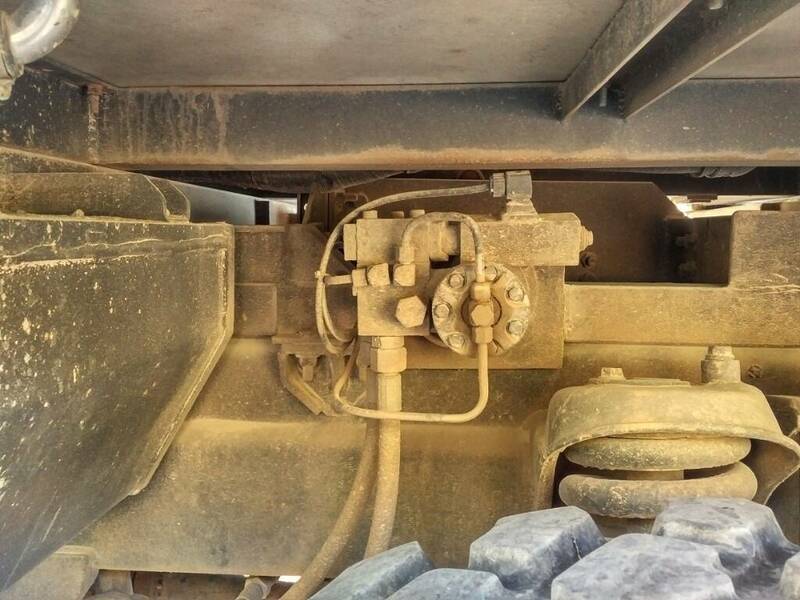 If you say that the front axle is heavy then the 8x8 with 2 front axles would be even heavier. One I saw here in the forum some one talking about that because his truck as he said, while driving down in mud or sandy terrains, then the front of the truck literally “buried itself” due to the heavy both front axles. To take in count seriously, then! We are almost deciding what we will take including dimensions. The model and engine also we have decide to take the easier to deal with. 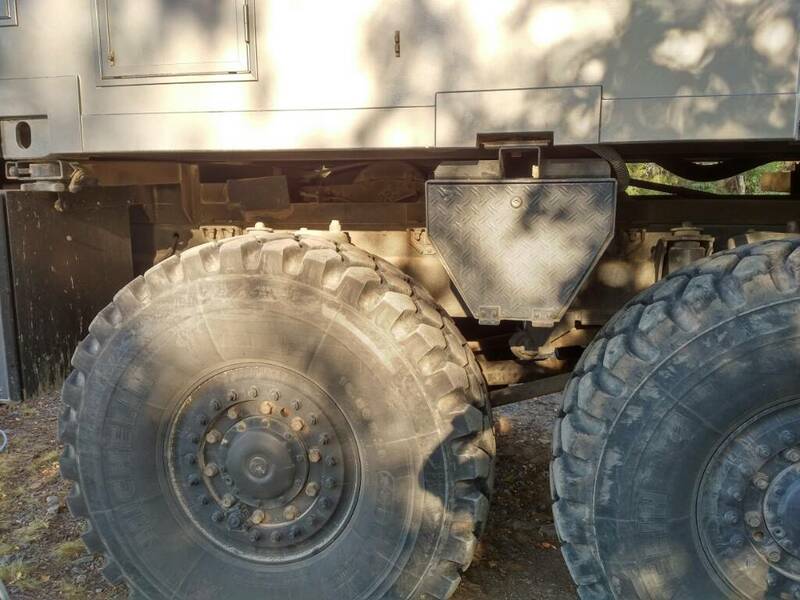 Early in the post, at the beginning I told that we were at 2 days to buy a 1999 truck that finally someone told us that this particular truck has no spare parts for the suspension and to adapt to receive the frame would be highly expensive. The food here was the later model 99, but thankfully we knew that before the purchase. In October/November we will be visiting the workshop of the builder as well as some truck sellers too. The fact right now about the 6x6 is that is shorter than the 8x8 and we by our needs and likes surely we will decide to go longer than 10m. The builder is agreeing about older the truck easier to deal, and we love classical vehicles too. As I told you we have an 1964 dodge and we had drove it many times in long distances without problems, it is also pure steel made! The longer was 1100 kilometers in one day! And for sure it can last much more than that! About the lifting roof, at the beginning to decide to make the truck, almost a year ago, we search for it but the price increase considerably and we decided to pass it by now. Now we are talking to reduce the high as much as possible, maybe 3.70 would be great! We decided to take the inflation system because we really like to be in sandy places. We used to be the weekends in front of the ocean in Baja Mexico while we were living there and we took our Truck AWD and it was great! We loved it. As you we think also to the possibility to improve the truck as our needs or likes demands time by time, this is a great advantage also. And we need to work inside so we need as much solar power as possible, the builder propose even to have a small eolien that will provide more energy and we loved it. 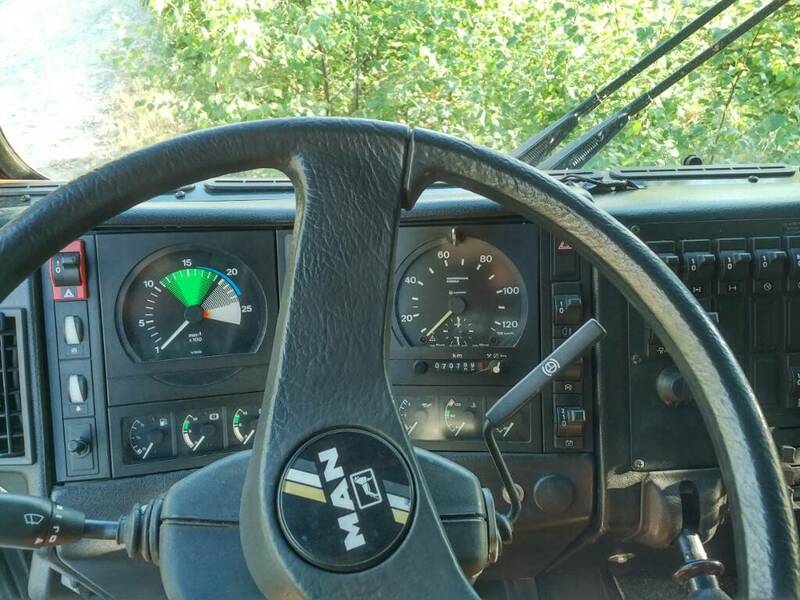 Thank you Martin for the comments and I just would like to ask you if you have some pictures of you truck or a link to see it in more detail! 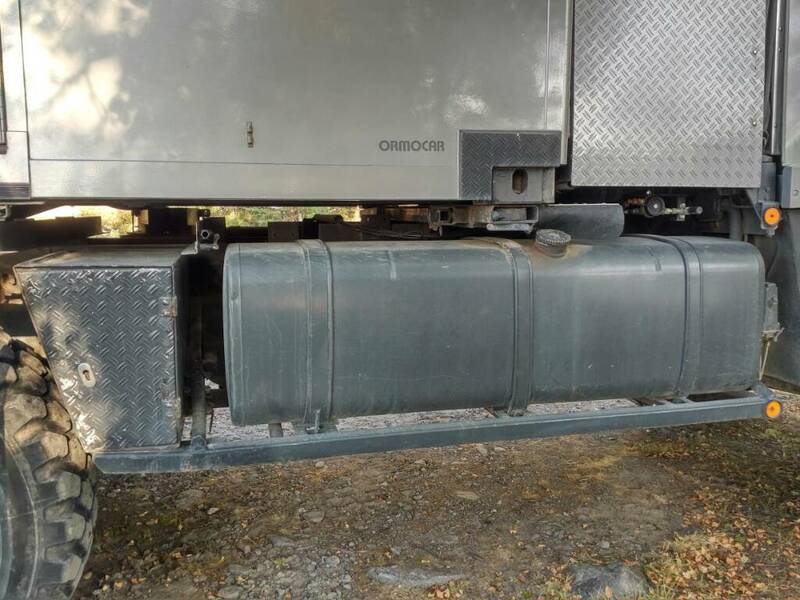 below some picture, when thinking of what to put between the Axles, don't forget you need a lot of stuff (hydraulic lifters, barrel fuel pump, towing gear, ...). In my case, the boxes on the roof of the driver cabin are really useful. The previous owner put a lot of thought and experience in it. 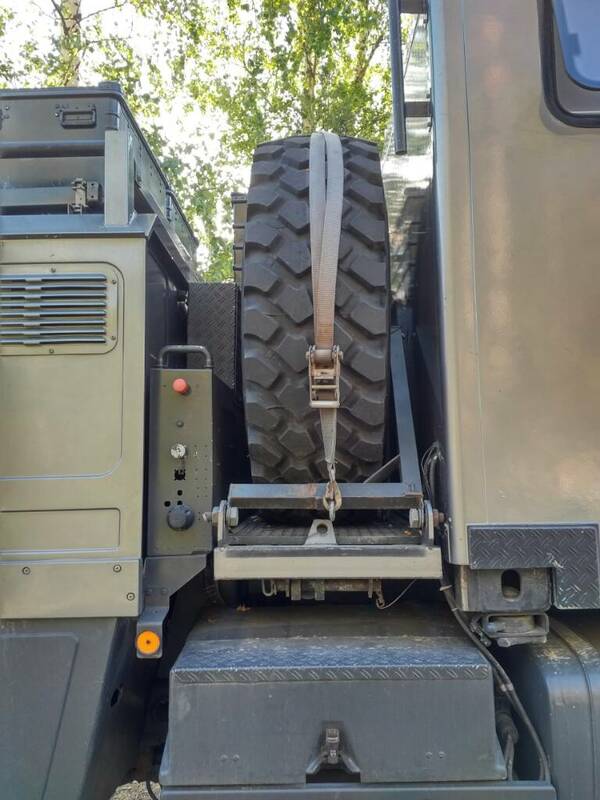 On the axle weight: the 8x8 has (besides the Axles) pretty much the same weight on the front as the 6x6. 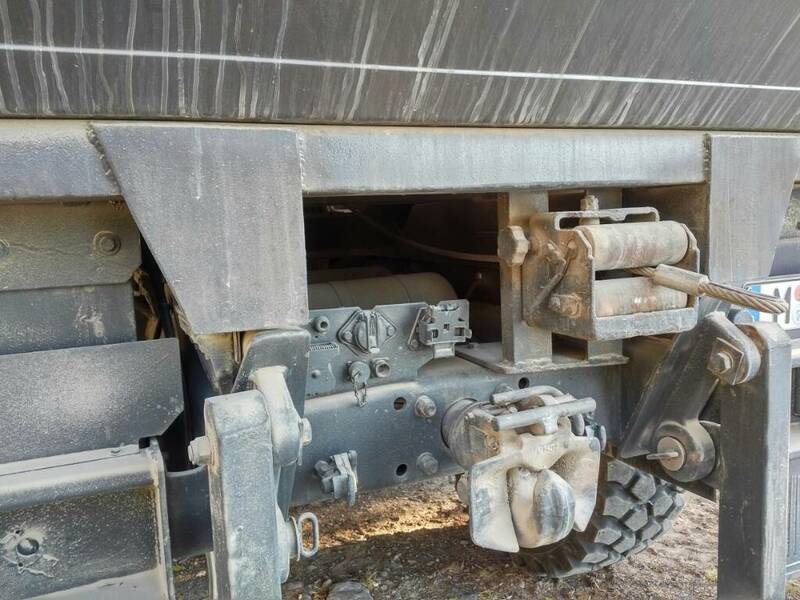 However, if you distribute the weigh on 2 Axles you end up with a lower weight per square cm, even with the 2nd Axle, hence you should be better off with the 8x8. But this is a very specific situation, and the size and maneuverability disadvantage of 8x8 is far more of an issue. Feel free to send me a pm and we can chat over phone if you like. I am writing this while on a spontaneous Trip through the Austrian and swiss alps. Travilling fast like i always Do. This time it is 1000km and 5 high Passes between 2100 and 2500m in 3 days. While travveling With a 180hp ducato van I have been checking for Truck reglementations and i measured Street Sizes. As a results i am thinking about buying a 4x4 Kat for test reasons. I still dont think a 6x6 Would make any difference here over n 8x8. ... In fact... For this Kind of Travilling a poessel ducato Would be perfect i think.... 4x4 as a luxury addon. Do you speak about reglementattions or Real physical Problems? As my Nickname suggests i am always sceptic when something is said to be "Not possible". Well, your truck seems pretty full of equipment and no space is wasted, for sure is what we are thinking, 8x8 or 6x6 this space would be totally fulfill. 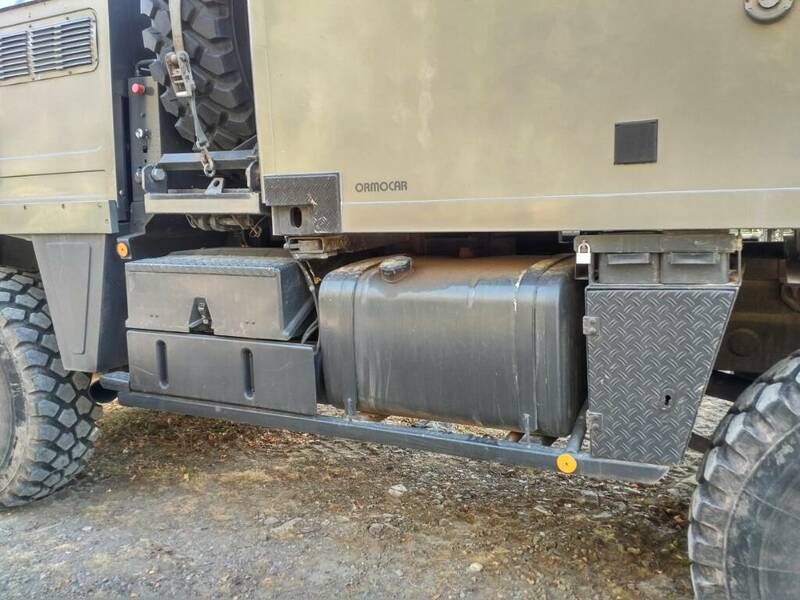 The pictures are very clear and I can see your tanks and boxes to store any stuff that your need, I have a question... Do you have just 1 spare wheel?, the cam 1 what is showing, I can not understand what is that? and what exactly is the year of your truck... I just remember A1.1? For sure I will be sending a PM to be in touch thank you for that!!! For sure anything smaller than a Man Kat will be fitting better any road and obstacle! Interesting what you say about no difference between a Man Kat 6x6 or 8x8... My wife and I have been driving in standard cars trough the French Alps and a couple of years ago we were in the highest road in Europe... it was what the street sings showed, it was winter and everything was fully white, a great trip! 3) The A1.1 designation was used by the German Army/Air Force only. About 150 pieces of A1.1 6x6 are currently known to be ordered by the AirForce (mostly for versions with radio antenna masts) and about 430 pcs for the 8x8, mostly as the versatile Multi transporter. 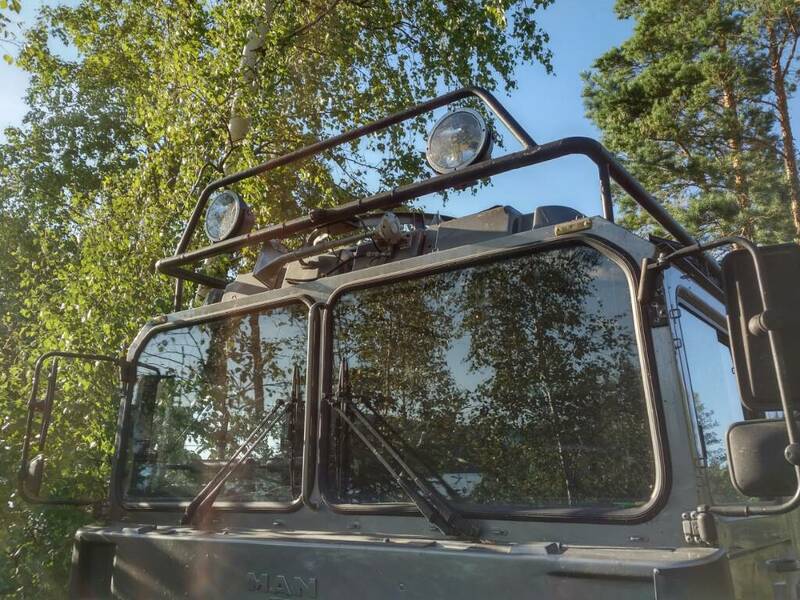 While the 6x6 are gradually being sold off (the radio antenna systems isn't used anymore), the 8x8 are quite rare on the civil market, as they are still in full use for generic transportation efforts. For availability and cost of spare parts reasons, I would recommend that you rather focus on KAT 1 or A1 types and less on the A1.1 types if 8x8 is mandatory. Out of the 8600 or so KAT 1 types ordered by the German Army in 1997, about 2100 of those were 8x8. For the approx 1160 KAT A1 the Air Force ordered around 1990, about 700-800 were 8x8. Of the 8x8, about 400-500 were of the broad ladderframe type (2900mm overall width), the rest with the usual 2500mm width. Unfortunately, we don't have exact production numbers for the A1 (unlike for the KAT 1 series), so we rely often on vehicle serial numbers of trucks being sold to the private market for educated guesses. Finally, about 3000 KAT 1 trucks are still in the ownership of the German Army, either in active duty (2500) or as spare parts supplier (500). Amazing, that a "simple" thing like a truck is still being used 41 years after it was introduced to the service. Testament to the superior design and abilities inventent then and even used today. Waoo, this is "information" thank you very much Andy for this encyclopedia of Man Kat, I immediately will be copying to my files to keep it! Ps; How did you cut the message to just ""quote"" a part instead to quote the entire message? I decided for one tire only, since I have the stuff to fix tires and in 150.000 km with Unimog and Kat only had one flat. However, depending on where you go, a second tire might make sense. 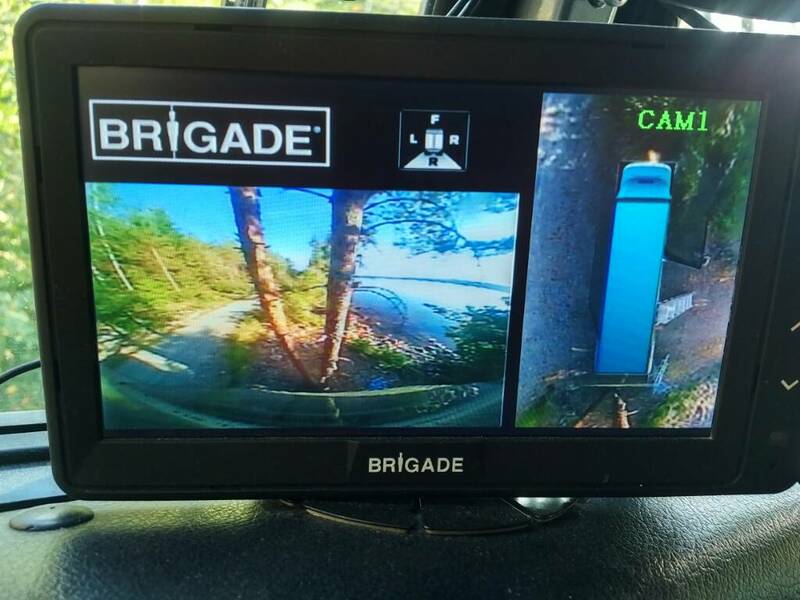 Cam 1 shows the bird view of the Kat, picture is composed out of the images of 4 cameras around the Kat. There is a more detailed threat in the forum. It is quite helpful but could have a slightly higher resolution. How do you access the forum? If you use Tapatalk from your phone / tablet, then quoting only a part of a message is not possible. If you use a browser, then you can just delete the text between the "quote" "/quote" tags that you do not want. Ok, I understand. I think also that one is enough, but as you say, a second makes sense depending where we are. I suppose that going in rocky terrain or crossing industrial places have more risk than just in nature itself, but for sure I will experience it once being on the truck and driving it! Thank you about quotation, and I access by both devices, desktop and mobile ones. Hi Augusto, what's the latest on this project? I found this discussion to be a great source of first hand overland travel experience. The pros/cons discussion for 6x6 / 8x8 is particularly interesting. Do you have any preliminary plans for the box yet? 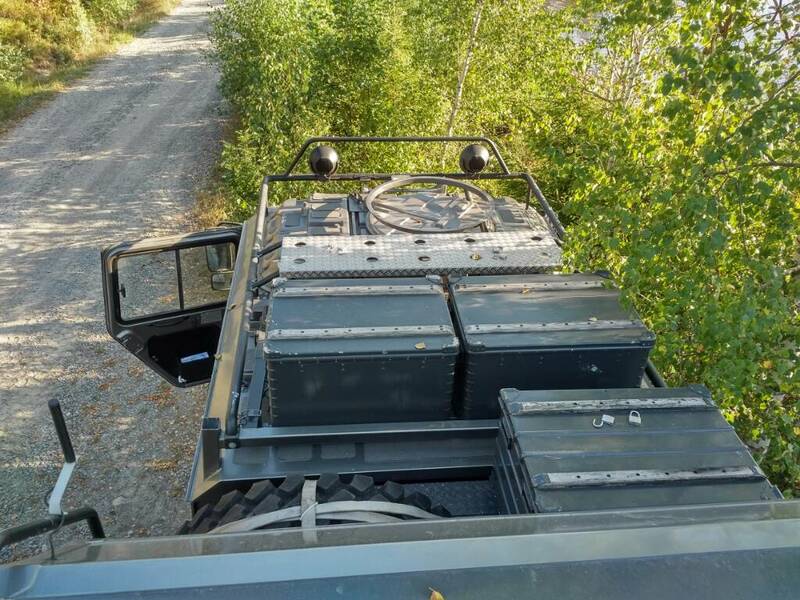 Are you going with the BlissMobil approach that all is contained within the habitation box or more conventional approach with various tanks mounted in/around the chassis rails? Well, the project is going and yes, this post was a great mix of information. Thank to the members that posted here helping me and giving any comment! The project will be doing by gekkotruck and there have been many many information exchange meanwhile! I will be posting here any other news coming! Please feel free to post or comment any commentary that could be useful!